Just went with a friend...looked like a cute casual place to dine. Reasonable prices for average food. 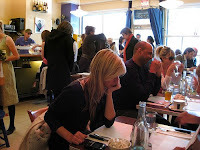 Restaurant is quite small and the service is choppy- waitresses seem to hold guests responsible for the small space, pushing diners around as they navigate the tight quarters. All in all - not a terrible experience given the price point, but there are many other better choices in the neighborhood.